Keys for Kids Radio - 24/7 Streaming Music and Audio Drama for Kids! 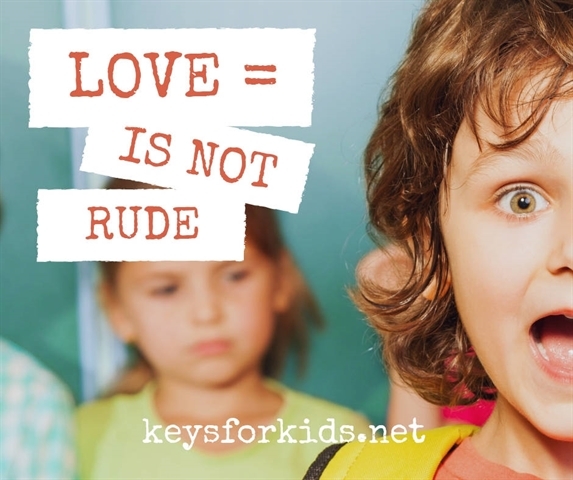 - Love is Not Rude - Love Does Giveaway! Remember, these descriptions are first a reminder of the kind of love God shows us. God’s kind of love does not seek to cause problems, and it does not belittle others. His love chooses appropriate actions and responses that help other people. You are growing up in a time when rudeness is more and more acceptable by the world. Public behavior and words that were unthinkable in your parents’ generation are now way more common. But the problem with rudeness, is that it is rooted in selfishness (something we all struggle with), but love can’t be selfish, because love is concerned for the other person’s well-being. Therefore, love shows good manners. Remember, our actions either communicate “it’s all about me” or, “it’s all about you”. Ask God to help you recognize times you’re tempted to act rudely, and then help you to show courtesy and manners instead. Join the Love Does Giveaway for Valentine's Day by submitting a story of how you've shown love to someone in your life. You could be randomly selected to win the Love Does Prize Pack! [Super Cool VIDEO] Flying Down a Mountain!